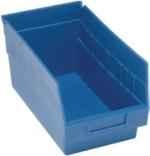 Shelf bin boxes are commonly used to replace worn out corrugated bin boxes or parts containers. Quantum plastic shelf bins are the most economical way to store parts and components with plastic bins. when handling large groups of inventory items by color coding. Model No. L" W" H" CTN. Model No. Carton Qty Ctn Wt. Price per carton Model No.